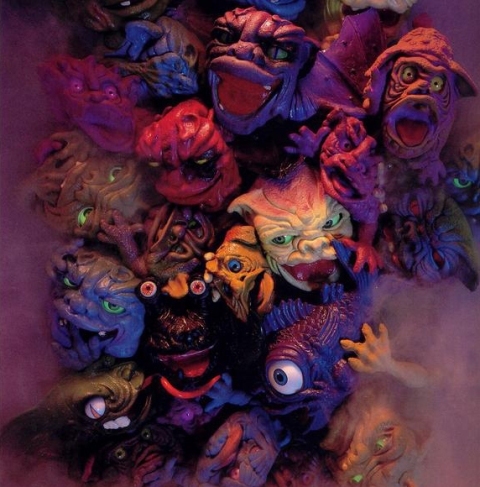 Cool Monster Toys of the 80’s – BOGLINS!!! I will always say that growing up in the 70’s was the best time to be a kid. We had THE BEST toys available to us and in my opinion, there has not been a better assortment of toys available to kids since. One of the top toy manufacturers at the time was MEGO, who specialized in the 8″ WORLD’S GREATEST SUPER-HEROES figures as well as MICRONAUTS and even a cool robot called 2-XL that played 8-track tapes full of interactive games and questions. Maybe it’s because I was older but the toys of the 80’s and 90’s did nothing for me, with a few exceptions. One of them was a toy line that came out in 1987 by Mattel called BOGLINS! This series of rubber monsters were puppets that you could achieve all kinds of facial expressions with. The larger BOGLINS, Drool, Dwork and Vlobb, also had mechanisms behind their eyes so that not only could they blink their eyes, but the eyes could be moved back and forth! Another cool aspect of these toys were the clever packaging. The boxes were designed to look like wooden boxes with a cage front. With the smaller BOGLINS the cage bars were printed onto the clear plastic that you saw the BOGLIN through. On the larger ones, it was a plastic insert that could be opened to take your BOGLIN out. 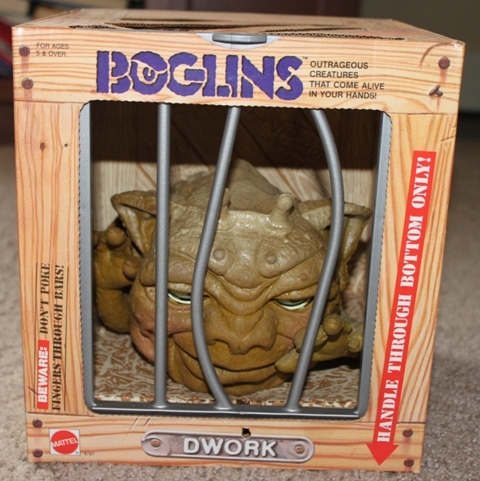 Also, the larger BOGLINS had holes in the bottom of the box so that you could use them as a puppet within the cage. In 2000 Mattel released two new BOGLINS lines. The first included two large BOGLINS called Belcher and Gangrene, which are highly sought after in the collector’s world. The reason for this is that they were actually too big for their boxes and it was hard to find copies that didn’t have damaged tails. The second were MINI-BOGLINS. The variety least like the standard “large” and “small” hand puppets were the “mini” boglins. They were made out of solid PVC and unlike their predecessors had no movable parts, so were essentially plastic models similar to Monster in My Pocket as well as being sold in blister packs (containing 3 or 5 monsters) and boxes (containing 5, 10, 20 or 100 Boglins) they were available packaged individually, each packet contained a random Boglin and buyers didn’t know which Boglin it was, a common practice, similar to Gashapon. In the UK they were available in news agents and stores like Woolworths, again a common practice. The Boglins has a small back story in this incarnation, they had lived in a swamp but their swamp was drying up and their king had sent out the Boglins to find new places to live. The Mini Boglins were first released in 1991 with 36 Boglins subdivided into 6 ‘tribes’ with six Boglins in each tribe. 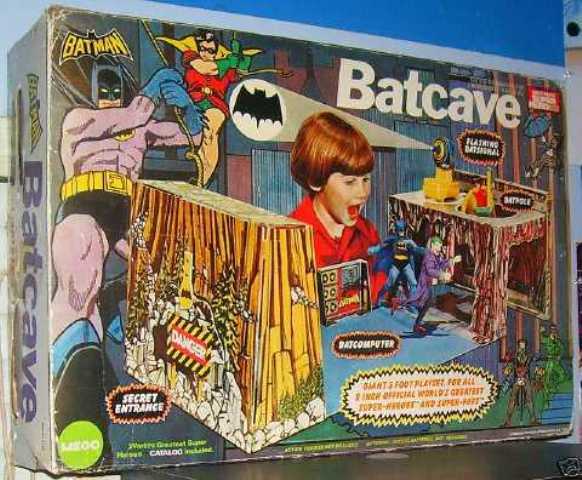 Over time they were produced by several companies including 7 Towns Ltd. for Mattel. 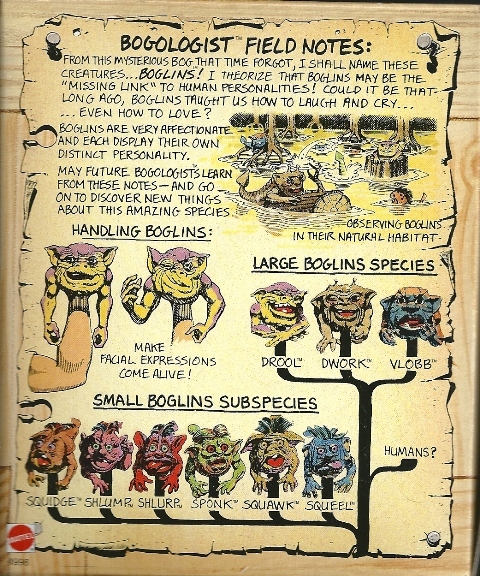 By 1992 there were 56 Boglins in eight tribes with 7 members and by 1994 eight tribes with eight members. Included on many models was a secret label that would show only after the Boglin was heated and left to cool, this was supposed to be their ‘secret code’, part of the toys’ storyline. The Mini Boglins Swamp Carry Case was also sold separately, made of molded plastic it unfolded to be a small landscape on which children could play with the Mini-Boglins. 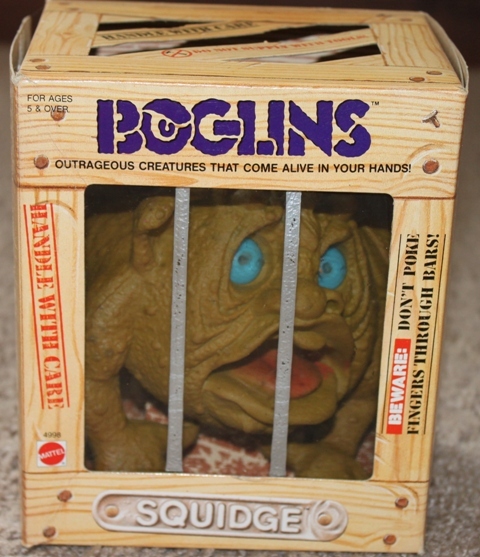 A Boglins Cage offer however was run in the UK on the backs of the Mini-Boglins and Baby Action Spitting Boglins blister packs. If eight tokens were collected and set together with a cheque or postal order for 80 pence to Ideal Toys a small plastic cage would be sent that could store both makes of Boglin. 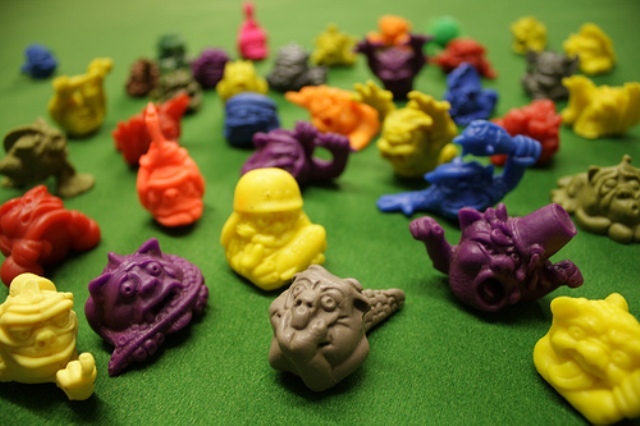 As well as the regular Mini-Boglins four additional models were made for a special line that came in Slime toilets – plastic toilets filled with substance similar to toy slime. Coming individually in blister packs containing 1 toilet, 4 mini-boglins and 1 Slime Boglin. The Slime Boglins were Splutter, Splurge, Splash and Splodge. 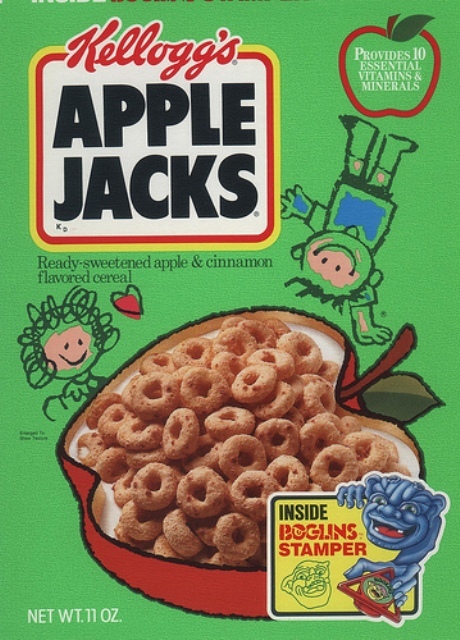 The BOGLINS’ back story was also featured on the backs of the packaging of the larger species. 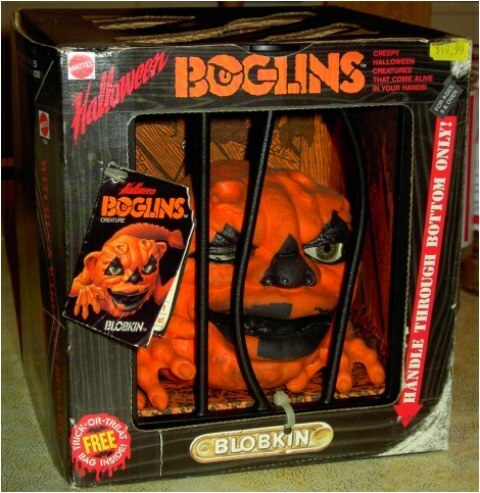 They also released Halloween BOGLINS painted to look like a skull or jack-o-lantern (that came with a free trick-or-treat bag) and there was even a deal with Kellogg’s that allowed BOGLINS prizes in their cereals. As an afterthought, these toys were so cool that one of the large BOGLINS, Dwork, was used in the 1989 movie LOBSTER MAN FROM MARS! Since this was a low-budget movie, why create your own latex creature when you can go to your local toy store and buy a pre-made one that does everything you want for less than $20.00? This entry was posted in Monsters, Vintage Toys! and tagged Apple Jacks, Batcave, Boglins, Cereal Prizes, Drool, Dwork and Vlobb, Lobster Man from Mars, Mattel, MEGO, Micronauts, Mini Boglins, Monsters in my Pocket, Splash and Splodge, Splurge, Splutter, WORLD'S GREATEST SUPER-HEROES. Bookmark the permalink. ← TALES FROM HORRORHOUND WEEKEND: Meeting George Romero! Really? We’ll have to check that out. Thanks for the tip, Voodoo Rob! Hey there, I know this article is a few years old now but thought I’d mention it has some errors, a few which stuck out were mini boglins didn’t come out in 2000, they were early 90’s – as the next paragraph you’ve taken from wikipedia even says, and more importantly the large ones that were released in 2000 – Gangrene and Belcher are most definitely not sought after in the boglin collector’s world haha, they are cheap cash-ins made of inferior materials and not even by the original manufacturers hence why they are always damaged, not just the tails that didn’t fit in the box due to another show of poor design, but all over their body including their face and a lot around the eyes, they weren’t designed to last a decade let alone 3 decades like the originals, hope that helps. Thank you for the corrections! I appreciate it!